The latests and greatest Drools 6.5.0.Final release is now available for download. This is an incremental release on our previous build that focus on a few key improvements to round up the 6.x series. Some runtime environments (like for example Google App Engine) don't allow to directly create new Threads. For this reason it is now possible to plug your own ThreadFactory implementation by setting the system property drools.threadFactory with its class name. Property reactivity has been introduced to avoid unwanted and useless (re)evaluations and allow the engine to react only to modification of properties actually constrained or bound inside of a given pattern. However this feature is automatically available only for modifications performed inside the consequence of a rule. Conversely a programmatic update is unaware of the object’s properties that have been changed, so it is unable of using this feature. A new type of MBean has been introduced in order to provide monitoring of the KieContainers, and the JMX MBeans hierarchical structure have been revisited to reflect the relationship with the related MBeans of the KieBases. The JMX objectnaming has been normalized to reflect the terminology used in the Kie API.A new type of MBean has been introduced in order to provide monitoring for Stateless KieSession, which was not available in previous releases. Composite field constraints now support use of formulae. 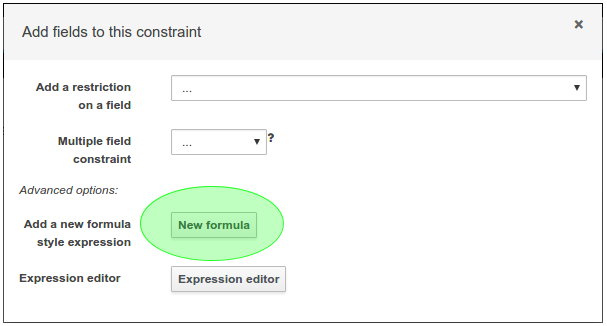 When adding constraints to a Pattern the "Multiple Field Constraint" selection ("All of (and)" and "Any of (or)") supports use of formulae in addition to expressions. The "Reimport" button invalidates all cached dependencies, in order to handle scenarios where a specific dependency was updated without having its version modified.